It is considered that a country house with a flat roof looks quite attractive and underlines the consistency of its owners, the sophistication of their taste and originality of thinking. 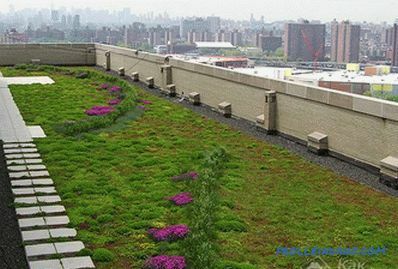 The flat roof can be not only original, but also quite practical. That is why such a construction is often used in regions with low average monthly precipitation. If you wish to equip a flat roof in areas with a lot of precipitation, allowable loads on floors and reinforcing structural elements should be taken into account. This article describes how to make a flat roof independently and discusses the features of various types of roofs. The original appearance of the building, as well as the possibility of arrangement on the roof of the site, used to taste the owner. Savings on the construction of a roof that does not require the use of complex roofing systems for its arrangement and that has a small surface area. 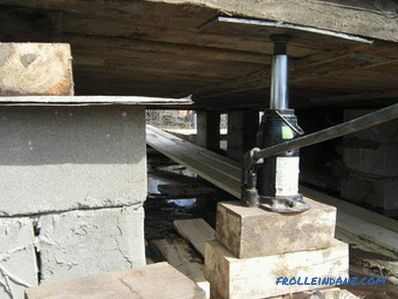 Repair of a flat roof in comparison with cattle structures is quite simple and will not take you much time. The disadvantage of flat type floors is the need for careful design, taking into account possible maximum loads on the structure and the type of material used as a coating. In this case, the project lays the angle of inclination of the future roof (ranging from 3 to 12 degrees - depending on the annual precipitation rate). The basis for flat roofs are usually either reinforced concrete floor slabs or beam structures made of metal profiles. 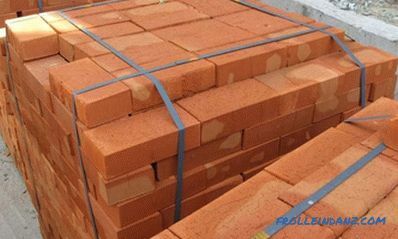 At the same time, not only the composition of the roofing pie, but also the technology of its manufacture depends on the type of base you have chosen. roofs made of corrugated board. In terms of their intended purpose, all such coatings are divided into exploitable and unexploited, differing in the index of foundation stiffness. The monolithic coating is traditional and widely used types of structures (the so-called "soft roofs"). 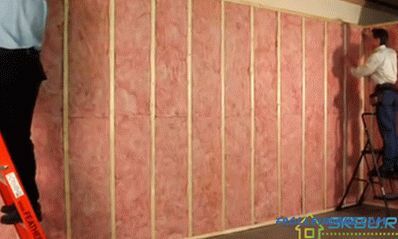 In the section, such a roof consists of a slab-base with a film vapor barrier placed on it and insulation, as a rule, which is used mineral wool. A waterproofing carpet made of rolled bitumen-containing material is laid on top of the insulation. 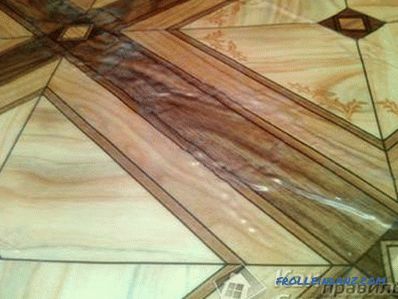 The advantages of this kind of multilayer coatings include their relatively low cost and extreme ease of installation. 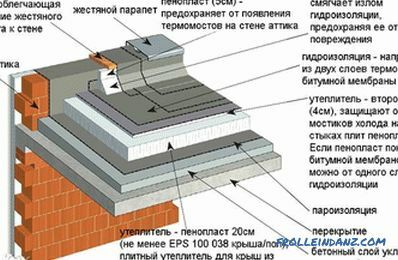 Sometimes metal dvutavrovy are used to prepare a flat roof of the type "monolith" beams with a section of 12‒15 cm, on the lower shelves of which a continuous sheathing of boards is installed, covered with roofing material. The fittings are placed on top with a gap, after which the space is poured with concrete. After the concrete mixture sets, a classic “soft” coating of roll materials is laid over the ceiling. 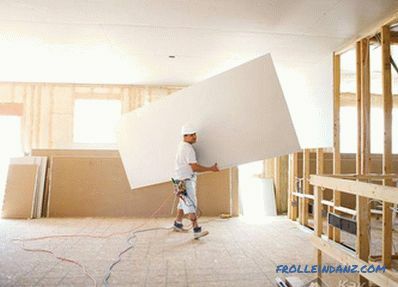 Profiled is the most economical a variant of the base used in the manufacture of a flat roof. 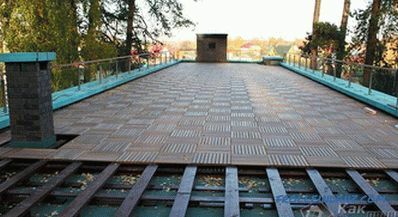 This material can be used only in those cases when the roof is not intended to be used as a permanently operated platform. The formation of the roofing pie in this case is practically no different from that already described earlier, except for the fact that such a roof needs additional warming. 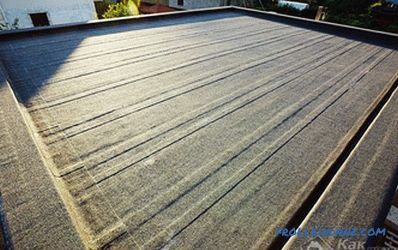 Vapor barrier of the roof is usually made of plastic film, which does not allow the air vapor rising from the living room to act on the heat-shielding layer of the roofing pie. Waterproofing gasket is traditionally made of rolled materials made on a bitumen basis.In addition, modern materials such as special mastics or sprayed membranes can be used for these purposes. On the base plate, using a bitumen primer, waterproofing is mounted, over which plates of rigid insulation with a reinforced coating placed over it are mounted. This whole sandwich, or rather its last layer, is covered with a special geotextile fabric that protects the insulation from external damaging influences. Any material suitable for their use (including paving slabs) can be used as the final coating of inverted roofs. Such a roof can withstand quite large loads and can used as a permanently operated recreation area. 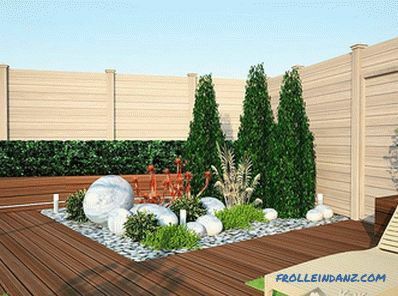 According to the current SNiP, a small slope should be provided on one of its sides (within 1–4 °) when arranging a flat roof to avoid the accumulation of rainfall on the surface cover. It should be borne in mind that even a small amount of residual moisture represents a tangible threat to the safety of the entire roofing pie as a whole. 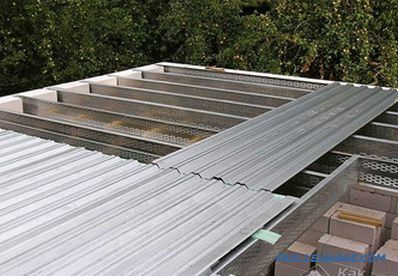 All deformations and destruction of the outer coating, which often occur during the operation of the roof, are usually the result of repeated freezing and thawing of residues of accumulated moisture. When equipping the roofs of buildings of heated type, this list expands due to the additionally used steam and waterproofing, as well as the insulating layer that is mandatory for this case.